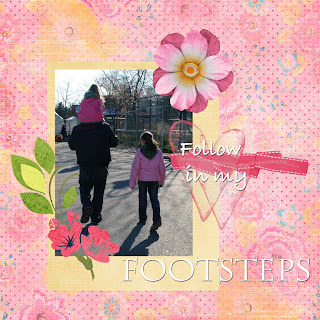 Create a layout using the word 'footsteps.' It can be digital, paper, or hybrid, your call. Be creative and lets see where you take this. Please leave a comment directing me to your version either in an online gallery or on your blog or send me an email with a jpg of your layout and I'll feature it on the blog later this week. All of the papers and elements were from A Little Dreamer Designs and were created by Michelle Coleman. The kit is called Wild Sorbet. I especially love the elements in this kit. They have great frames, ribbons, transparent shapes, and rub ons. Very fun to play with.